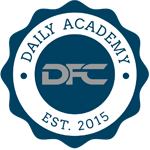 Welcome to Chapter 5a of Daily Fantasy Cafe's Advanced Bankroll Management Series. In this chapter you will be introduced to decreasing your risk and increasing your safety from a day-to-day basis. In this chapter we will talk about. While this may be a bankroll series, one of the least concentrated parts of bankroll management is player exposure. In cash games we typically play one to two lineups per slate. If you are playing $1,000 dollars on one lineup every player is worth essentially $1,000. If we played two lineups without any overlapping players, the amount of exposure would double and amount of essential risk would decrease by 50% to $500 per player. This topic specifically relates to GPPs, as risking $1,000 of GPPs on one lineup is significantly riskier than risking $25 on forty lineups. When we talk about risk associated with DFS, specifically related to multi-entry GPPs, we must discuss player exposure. This is, the most important aspect in understanding how to manage your bankroll and the risk you are associating with it. To give you the best understanding of this topic, I will first explain to you how it works, then show you how to implement it. When beginning to decide the amount of lineups you want to enter, you will want to look at the amount of money you are looking to play for GPPs. In our example we will use $100. Next you will want to pool together your players based on the position they play. Note that this is significantly easier on sites without multi-player eligibility but can be done on many sites. Once you have an understanding of the players you “like" for the day, it is now time to decide on the amount of lineups you are interested in doing. My first suggestion is to always take the most important or easiest to decipher position. 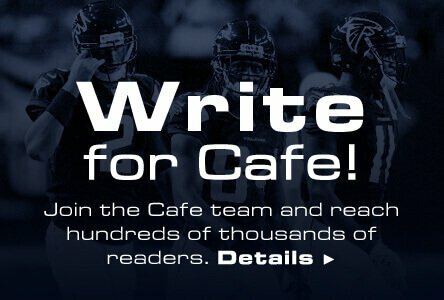 For example, on FanDuel, I will look at the number of pitchers I will be using for baseball, number of quarterbacks for football and number of centers for basketball. Once you have these players down you can begin deciding your level of lineup. If our “position" includes 4 players we like that will include at least one of each in every lineup, we already know that each of those players will be worth $25 each ($100 / 4 players = $25 per Player). This is the part where you decide the buyin of games you are going to be playing. You obviously can play a maximum of $25 / lineup for 4 games or decide you want to increase exposure. For this example we will assume that players be used 5x in the $25 allocated towards them. This means that we will ultimately be playing 20 total lineups. The next part is the most crucial part of player exposure and that is going through each player and position and determining how much each player is worth to you. It is possible that you decide a certain PG you want to have be worth $40 and a SG worth $10. However you decide, this is the initial act of creating a player exposure pool. The reason this is so effective in managing a bankroll is you can decrease or increase risk specifically by the amount of money allocated toward a player. If you allocate him to 100% of lineups and he fails, it is highly likely all your lineups will fail. If you allocate him to 50% of your lineups and he fails, you are still in good shape with 50% of your lineups. Typically, I will look for my favorite “lock" of the day and set a maximum threshold of money for him. This gives you a good understanding of what your best player is worth, what your medium players will be worth and what a limited exposure player will be worth. This is similar to creating a bankroll portfolio except you are creating a portfolio of all your favorite plays of the day. You are allocating funds based on strength of play, but also hedging your bets, to account for the unpredictable that may occur. When you are finished with your player pool you will begin constructing lineups based on your allocation. 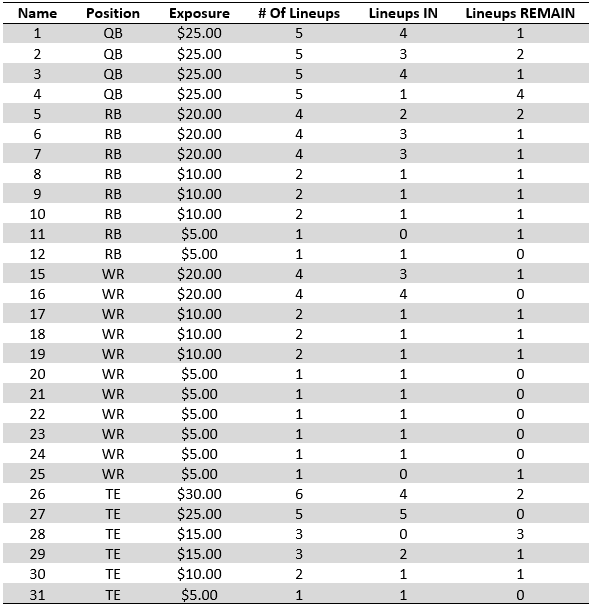 In our example, if you have a player listed as worth $5 he will be only in one lineup. If you have him listed as $50 he will be in ten lineups. While this may seem like a lot of work, it is much easier if you stay organized. One-way to do it is by using excel to create a table as below. You can make this process as detailed or simple as your like. As you can tell above, this is a very basic table that shows the amount allocated towards a player and also a tracking system based on how many lineups he should be in versus how many you have placed him in. This should be used as a guideline as your multi-entering GPP strategy begins. Make a table/template that works for you and helps you allocate your funds appropriately. By doing this, you are allocating funds towards player you like more, and limiting your risk by setting a threshold for the “top" player. This will decrease your risk long term, keeping you in the game for a big payout.